Today we want to share with you a recap from last week’s 2016 Women’s Forum! We hope you’ll join us next year! 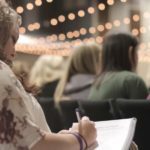 Women’s Forum is November 9-11, 2017, in Nashville, Tennessee. Registration is now open!